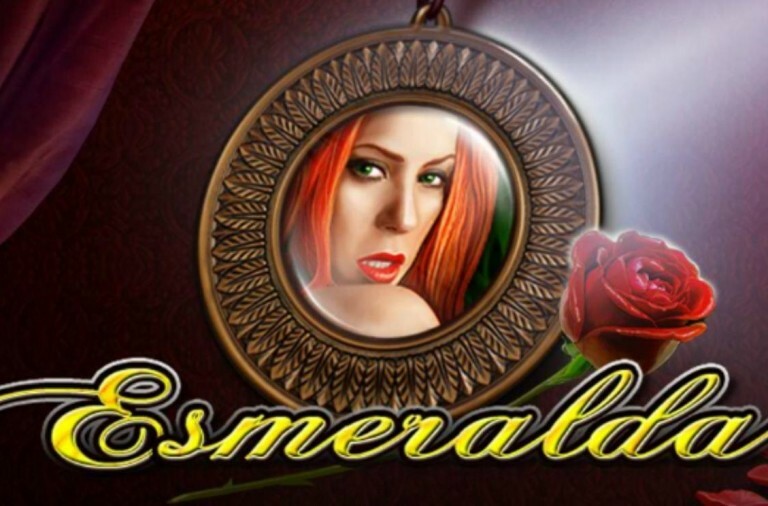 If you are looking for some enjoyable new slots then head over to Winner Casino. A number of exciting new titles have arrived at the casino and they all give you the chance to land huge payouts, including progressive jackpots. Discover three of the new games below and then head over to start playing your favourites. 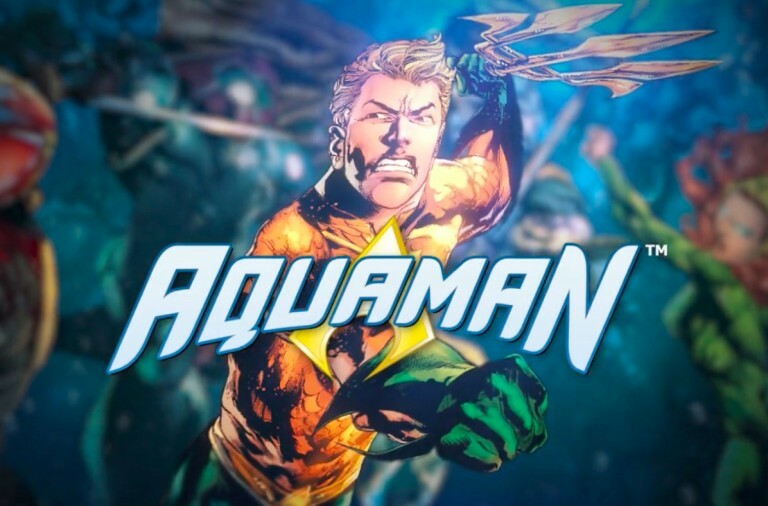 If you enjoyed the Aquaman film released last year then you will love this new slot at Winner Casino based upon the superhero. Not only does it bring the characters to the reels, but it is packed with features and linked to four progressive jackpots. Aquaman is a 5 reel slot with 3 rows and 243 ways to win. The game has cartoonish style graphics and behind the reels, you can see a view of Atlantis. There are six high value symbols, Aquaman, Mera and four different villains. The lower value symbols are the playing cards 10 through to A. The wild symbol is Aquaman’s trident, it will substitute for all of the other symbols, except for the free spins symbol, to help and form winning combinations. If a stacked Aquaman lands on the second reel, the Trident Wild Respins begin. He will throw his trident onto the reels and leave three adjacent wild symbols in place. The wilds are frozen on the reels and they respin for free until a win is formed. If you fill the fourth reel with a stacked Mera symbol then the Ocean Rush Respins begin. She will choose one of the symbols on the reels, lock it in place and respin the reels. Any new matching symbols will also lock in place and this continues until no more land. Best of all, the Ocean Rush Respins and the Trident Wild Respins can be triggered on the same spin. Landing three, four or five of the Free Games symbols anywhere on the reels awards you 8, 12 or 16 free spins respectively. During the spins keep an eye out for the golden Aquaman symbols, as you collect them they will replace the villain symbols with Aquaman symbols for bigger wins. Four, eight, twelve and sixteen golden Aquamen will replace the villains in order of value. Furthermore, if you land two, three, four or five Free Games symbols during the spins then you will win an extra 4, 8, 12 or 16 free spins. Best of all, the wild symbols can award a multiplier of 2x, 3x or 4x when they help to form a win. 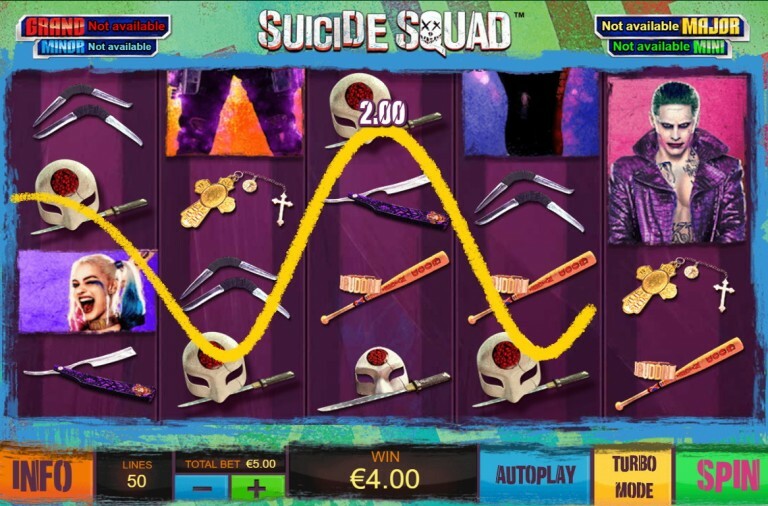 The slot is part of the DC Superheroes Progressive Jackpots network. The jackpot game can begin after any spin, regardless of the symbols that land, and once is starts you are sure to win one of the jackpots. In the game, there is a grid of twenty jackpot icons. You need to click on them one at a time to reveal the coloured jackpot symbols. Each colour represents one of the jackpots and finding it fills a segment of the corresponding jackpot meter. You win a jackpot once its meter is full. 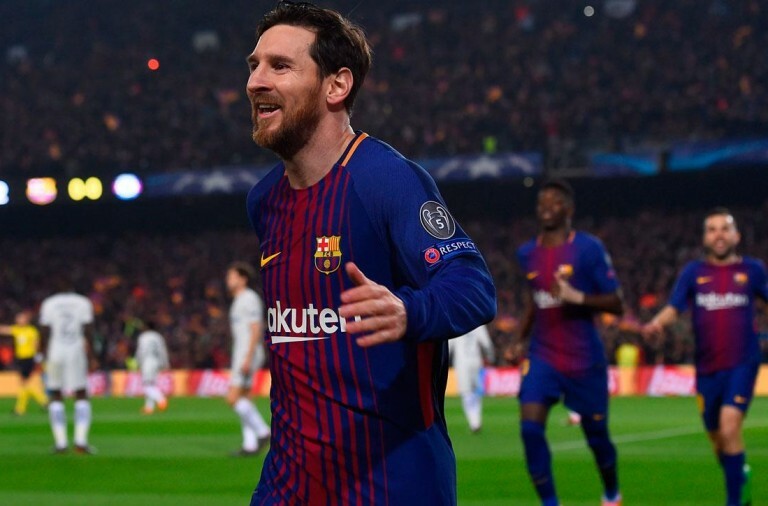 The Mini jackpot is won with two green icons, the Minor jackpot is won with three blue icons, the Major jackpot is won with four yellow icons and the massive Grand jackpot is won by finding five red icons. 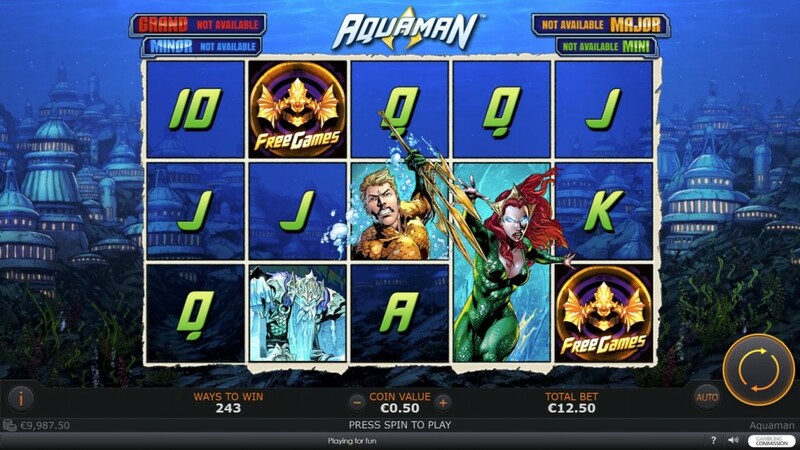 Aquaman has a betting range of £0.25 up to £500 per spin so everyone can enjoy this exciting new slot. In addition to the progressive jackpots there is a top payout of 500x for landing five Aquaman symbols in a row while Mera can payout up to 350x. Take a dive under the sea to join Aquaman today and with a bit of luck you’ll be the next winner of the huge progressive jackpot. If you enjoy motorsports and online slots then this brand new racing car themed slot is the game for you. Packed with features that could see you win big, it promises to deliver hours of fun. 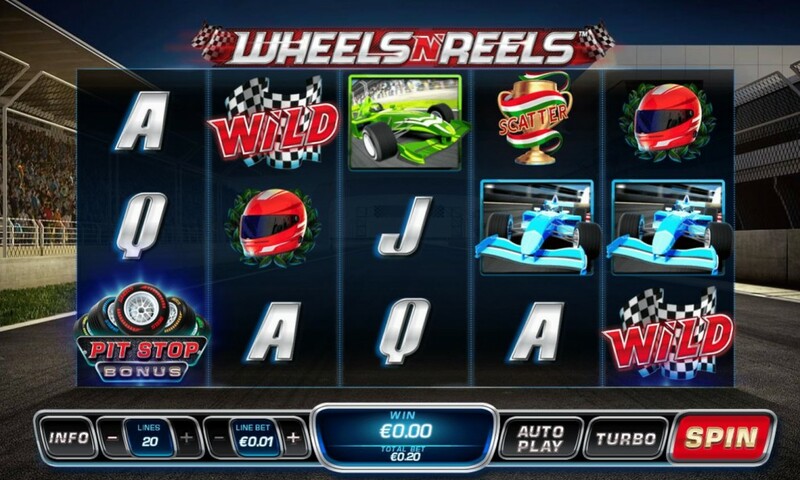 Wheels N Reels is a 5 reel slot with 3 rows and up to 20 paylines. The reels are set on a racing track while the high value symbols include red, green and blue racing cars, and a helmet. The lower value symbols are the playing cards A, K, Q and J. The chequered flag is the wild symbol, it will substitute for all of the other symbols, except for the bonus and scatter symbols, to help and form winning combinations. The scatter symbol is a trophy and there is a Pit Stop bonus symbol. If you land the bonus symbol on reels one and five simultaneously then the Pit Stop Bonus begins. First you need to pick tyres in the pit stop to win free spins and a payout multiplier. You can win up to 20 free spins with a multiplier of 10x. During the free spins if you land the bonus symbols on reels one and five gain then you will win up to 20 more free spins, and this way you can continue to win more free spins indefinitely. 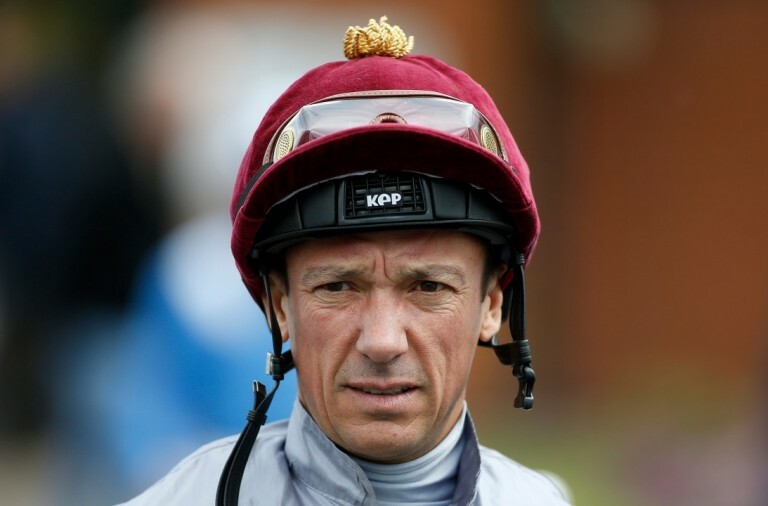 Wheels N Reels has a betting range of £0.01 up to £500 per spin, so it is suitable for all sizes of bankroll. There is a huge top payout of 10,000x up for grabs if you can land five wild symbols along a payline. The red racing car can payout up to 1,000x, the green racing car can payout up to 500x, the blue racing car can payout up to 400x, and the helmet can payout up to 300x. A, K, Q and J can payout up to 250x, 200x, 150x, and 100x respectively. 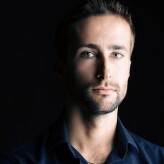 The scatter symbol also offers sizeable payouts of up to 50x your total bet. If you are looking for some high-speed slots action that will have you racing towards wins then set Wheels N Reels spinning today. If you enjoy playing for huge progressive jackpots then you will have no doubt come across the Age of the Gods series of slots. Now there is a new game in the series, Age of the Gods: Rulers of Olympus, and it is sure to provide you with hours of fun. Rulers of Olympus is a 5 reel slot with 3 rows and 25 fixed paylines. The reels are carved into a stone tablet and behind them stands Hera on the left and Zeus on the right. There are just four high value symbols, the gods Aphrodite, Hades, Poseidon and Athena, and the lower value symbols are the playing cards 9, 10, J, Q, K and A. The game has an astonishing three wild symbols, the regular ‘Wild’, a Hera wild and a Zeus wild. All three of these wild symbols can substitute for all of the other symbols, except for the scatter and bonus symbols, to help and form winning combinations. The scatter symbol features the gates at the top of Olympus and there is a thunderbolt bonus symbol. There are bonus features connected to the Hera and Zeus wild symbols. When the Hera wild lands on the reels, it will then move one reel to the left with each subsequent spin until it falls off the end of the reels. The Zeus wild behaves in the same way, except that it moves one reel to the right with each spin. The Battle for Power Free Games begin if both wild symbols land on the same row. When the two rulers of Olympus clash on the reels it will create additional wild symbols and this continues until Zeus is defeated. The Olympus Free Games begin when the scatter symbol lands on the fifth reel. You are awarded seven free spins that take place on a special set of reels that has 50 paylines. There will be up to 10 wild symbols locked on the reels for the duration of the free spins and the free spins can be retriggered indefinitely. The Thunderbolt Bonus begins when the bonus symbol lands on the fifth reel. Zeus adds up to seven wilds to the reels to help you form as many winning combinations as possible. Like the rest of the slots in the series, the game is linked to the four Age of the Gods progressive jackpots. All you need to do to be in with a chance of winning is keep the reels spinning as the jackpot game can begin at any time, regardless of what lands on the reels, and once it begins you are sure to win one of the four jackpots. In the jackpot game, you will see a grid of twenty gold coins and you need to pick them one at a time. Each of the coins represents one of the jackpots and when you have found three matching symbols, you win the corresponding jackpot. From largest to smallest the jackpots on offer are: Ultimate Power, Super Power, Extra Power or Power. 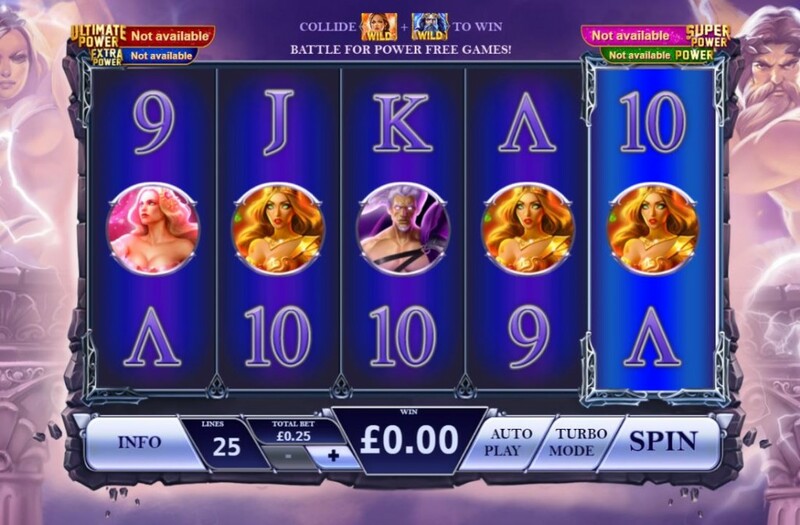 Age of the Gods: Rulers of Olympus has a betting range of £0.25 up to £625 per spin. There is a top fixed payout of 1000x for landing five of any wild symbols along a payline. Aphrodite can also payout up to 1000x, while Poseidon can payout up to 250x, Hades can payout up to 200x, and Athena can payout up to 150x. A and K can payout up to 50x, Q and J can payout up to 35x, and 10 and 9 can payout up to 25x. Why not scale Mount Olympus today and see if the rulers have a progressive jackpot waiting for you.